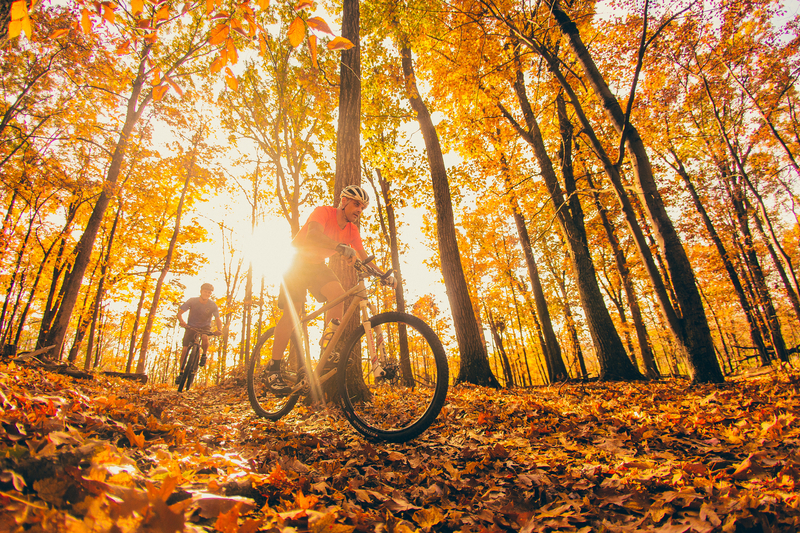 Roanoke, Virginia, has long been on the radar of outdoors enthusiasts, and for very good reasons. McAfee Knob, one of the most stunning and most photographed spots on the Appalachian Trail is a short drive and short hike from Roanoke. Carvin’s Cove, the second largest municipal park in the USA, offers up more than 50 miles of hiking, biking and equestrian trails, and it’s a short drive from downtown. The Blue Ridge Parkway follows the ridges that surround Roanoke, and as one of the most scenic and accessible drives in the southeast, some 15 million visitors cruise a few miles on this lovely motorway every year. But there’s more to Roanoke than just those big three. For starters, the dining scene in and around Roanoke is killer. Second, the craft beer scene has taken off like a rocket, and there are more than a handful of breweries and taprooms to visit. Third, it’s a great urban outdoor town thanks to a keen greenway project. Fourth, it’s family friendly thanks to that greenway, the trek to the Roanoke Star on Mill Mountain, and Center in the Square, a kid-centered science exploratorium in the heart of downtown. Throw in some top-notch museums and you’ve got reason to visit in any season. Today you have your pick of how to explore, on two wheels or two feet. Road cyclists and mountain bikers will find plenty of places to pedal. Section 12 of the TransAmerica Bicycle Trail, the 4,228-mile coast-to-coast bike trail, runs right by Roanoke, tracing a path from Christiansburg to Lexington, then connecting with the Blue Ridge Parkway and making its way to the coast. Along the Virginia section there’s tons of elevation gain, making the 368-mile section one of the toughest on the ride. Here you’ll most likely ride Routes 723, 785 and 779, a nearly 50-mile ride. Mountain bikers, look to Carvin’s Cove where some 50 miles of trails and fire roads make for some excellent loops. Dragon’s Back, a sister trail to Dragon’s Tooth (on the Appalachian Trail) is a strenuous 12-mile ride, and at the 7,190-acre Havens Wildlife Management Area you’ll find some amazing rides. 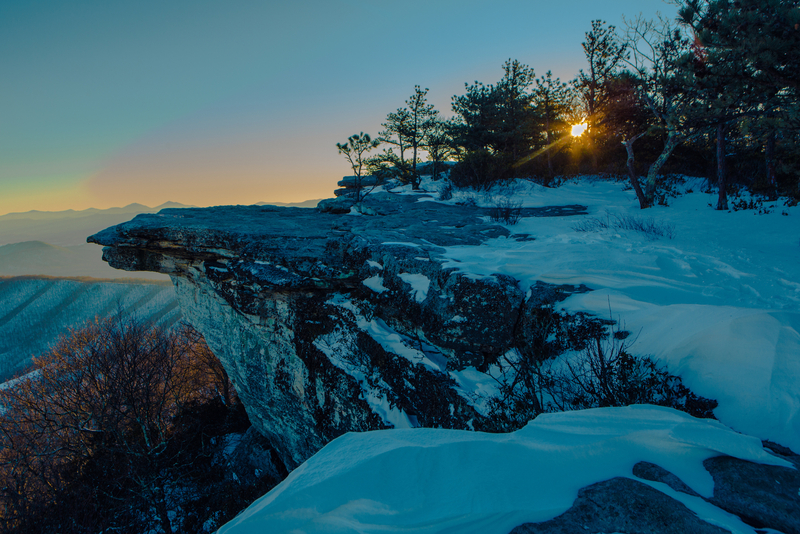 If you chose to explore on foot, the Appalachian Trail passes near Roanoke, and the hike to McAfee Knob is a bucket-lister, but the trek to Dragon’s Tooth or to Tinker Cliffs are likewise notable. Or, and this is a big or, you can try the 2-Day Adventure Option outlined below for a monster hiking trip. Day hikers, don’t sweat, McAfee, Dragon’s Tooth and Tinker Cliffs are all doable and accessible, as are the trails in Carvin’s Cove. Explore Park, just across the Blue Ridge Parkway at Milepost 115, has 14 miles of hiking and biking trails, and the Roanoke Valley Greenways make up some 30 miles of trails throughout the city and along the river. 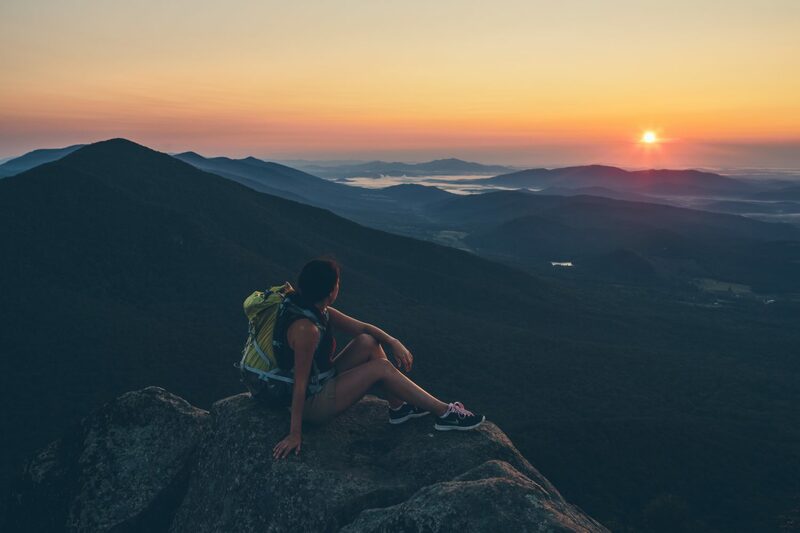 It’s summit day, but fortunately, both hikes are mild compared to some of the bigger summit hikes—like The Peaks of Otter, Sharp Top and Round Top, near Bedford on the Blue Ridge Parkway—and both are in town. First, head to Read Mountain Preserve, a 243-acre recreation area with 5 miles of trails. Take the 2-mile hike to Buzzards Rock where you’ll be treated to tremendous views of the Roanoke Valley. Your second hike is to Roanoke’s iconic star on the slopes of Mill Mountain. It’s true you could drive up and have a 5-minute walk to the Star, but this way you earn that Instagram post. Park on Walnut Avenue (yes, in town) and head up the mountain using first surface streets then a nicely graded and easy trail. This one’s perfect for the youngest or oldest in the group as there are plenty of spots to stop for a breather. At the top, just under 1.5-miles in you’ll reach the star and the platform overlooking Roanoke and the valley. Great view, especially on a clear day or at twilight. Before you leave town, make time to visit Black Dog Salvage, an astounding architectural salvage shop where you’ll find church steeples and stained glass, midcentury modern bar carts, Victorian-era hardware and treasures galore. There’s another way to do Roanoke, but it’s a big one. 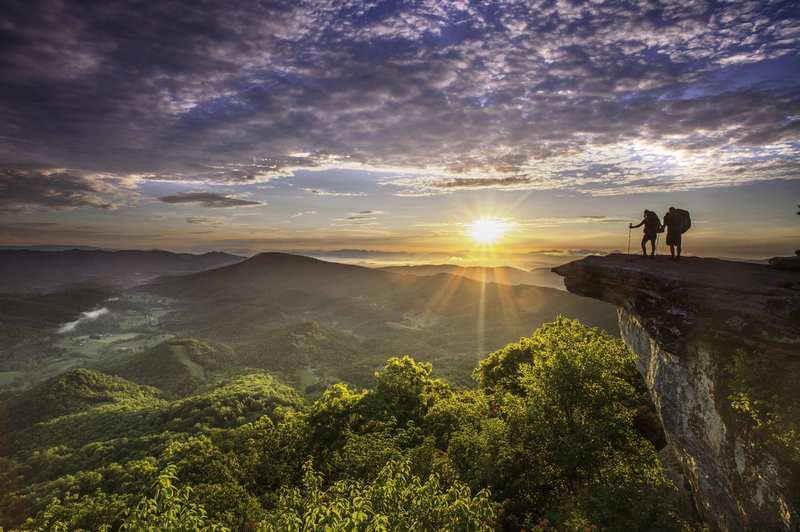 How about hiking Virginia’s Triple Crown in a brutal 32-mile, two-day loop that will take you to Dragon’s Tooth, McAfee Knob and Tinker Cliffs? To do this, start at Dragon’s Tooth and make the hike to this 35-foot spire, then follow the Appalachian Trail north to McAfee Knob. You’ll have some camping options depending on how you like to approach things. Camp here tonight (at the Johns Spring, Catawba Mountain or Campbell shelter) for a short first day and intense day 2, or continue north along the AT to Tinker Cliffs, 5.5-miles distant, and camp there at Lamberts Meadow before reversing course and following the AT back to your ride at the Dragon’s Tooth trailhead. Or you could cut this monster hike in half by parking cars at either end of the trail. This option gives you plenty of time and energy for celebrating your on-trail achievements with food and drink in Roanoke. Texas Tavern, also known as Roanoke’s Millionaires’ Club, has been open since 1930 and serves one of the best, and cheapest (seriously, it’s $1.45), cheeseburgers you’ll find. The menu is as small as the restaurant, which seats less than a dozen, but it’s cheap, charming and authentic. How cheap? So cheap you’ll find it challenging to eat $5 worth of food. And best of all: it’s delicious. One of the best restaurants in Roanoke, Lucky, also serves some top-notch cocktails, so they’re a must-dine. On the menu you’ll find everything from roasted bone marrow to fried chicken to boiled peanuts to Rappahannock oysters. Scratch Biscuit Co. keeps it simple with a menu of biscuits, toppings and sides, but there’s so much to chose from. The Jerry Garcia—a biscuit with smoked or regular tofu—The Cotton Hammer—a biscuit with chicken and Alabama White barbecue sauce—are good options, but so’s Bless Your Heart—biscuit, fried green tomato, bacon and chipotle—and every other biscuit on the menu. Blue Apron Restaurant & Red Rooster Bar, located in Salem, is outstanding in every way. It’s got a chic interior and serves equally-chic food. Foie Gras, lamb shank, a to-die-for seared salmon grace the menu, so come here hungry and ready for a memorable meal. If you’re in the mood for simple, get to Benny Marconi’s where the pizza is New York-style (read: huge pies and huge slices), the beer is cold, and the place is open late. Lucky. It’s no surprise that one of the best kitchen in Roanoke has a bar to match. Cocktails here are boozy, flavorful and surprising. House made bitters and syrups, bar-infused liquor concoctions and even smoked ice cubes grace the menu, so whether you want something floral and spring-like in your glass or whether you want something to put a little fire in your belly, the barkeeps here have you covered. Roanoke’s beer scene is bustling. 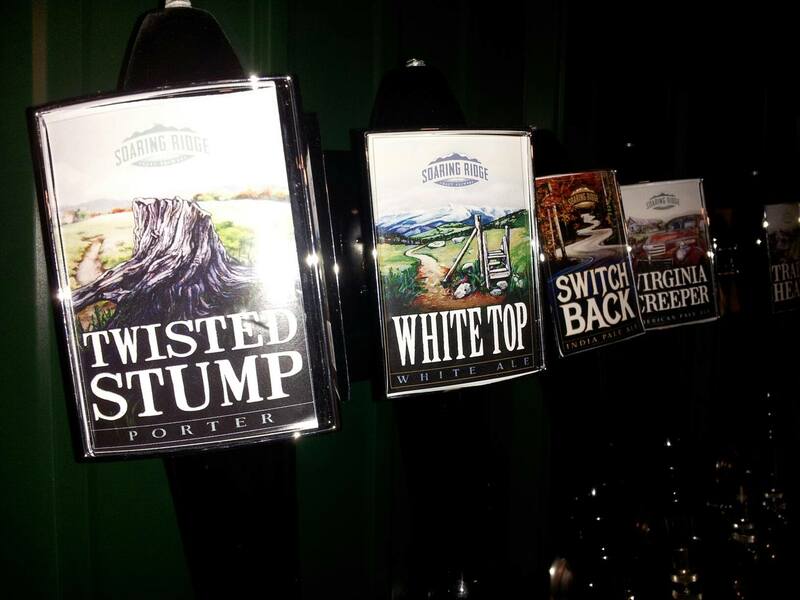 In Roanoke you have Soaring Ridge Craft Brewers and Big Lick Brewing Company; in Salem, Parkway Brewing Company; and in Vinton, Twin Creeks Brewing Company. Plus there’s Roanoke Craft Beer Tours, who’ll pick you up, pack you around and fill you full of beer before dropping you off at your hotel. The Community Inn, or CI to those in the know, feels like it’s been around forever because it has. Not literally, but it’s got a great, authentic vibe that so many throwback bars try to achieve. The bar food is good—burgers and tots, square pizza like you’d get in the school cafeteria—and the beer’s good and so are the people. The Hotel Roanoke will take you back to the days of Gilded Age opulence without that Gilded Age price, so take a look at staying here, just a block off the heart of downtown. Black Lantern Inn and King George Inn present two solid B&B options. For camping, look to Salem where you can set up at Dixie Caverns. Next ArticleTrail Mix – Merry Christmas!